If you’ve been kicking around those pool remodeling ideas for months, it may be time to put plans in motion. And what better time to take action than the New Year? Start on a productive note and begin with Phase 1: The Patio. From a simple replacement of patio furniture to a cozy nighttime candlelit nook, the possibilities are endless. Here are six design ideas to get you started. Channel the beach: To avoid the kitschy look, keep it simple. Stick to a three-color palette that incorporates two bright colors and one neutral hue. If you’re going for a nautical theme, look for striped navy blue throw pillows or anchor-stamped cloth napkins. Opt for sand-colored furniture with splashes of color throughout the yard. Refurbish an old cabinet for pool towels. Gather ‘round the fire: There’s nothing more peaceful than taking an evening dip in the pool and then relaxing by an outdoor fire. If you’re in the process of building a pool, consult with a designer on how and where to incorporate an elegant stone fireplace to complete the backyard. If you simply want to add a nice feature to your existing outdoor space, consider a Do-It-Yourself method comprised of concrete slabs or a store-bought cast iron pit. Not-too-shabby (chic): Whether purchased or handmade, shabby chic décor is more popular than ever. Transform your pool and patio with rustic furniture pieces and slightly mismatched lounge chairs. 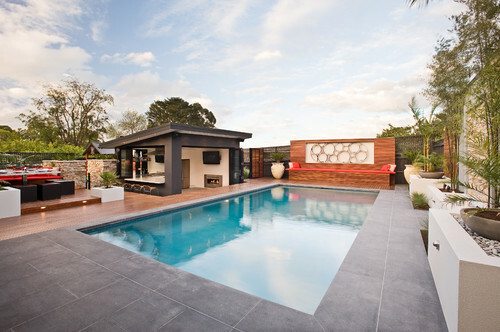 Shabby chic is one of the easier pool remodel ideas as the goal is to create a relaxed, lived-in sort of vibe. Opt for multiple French bistro sets rather than one large piece of furniture. If you prefer the latter, choose a farm table and adorn it with lanterns and funky place mats. All about the bar: An entertainer’s dream, a solid wet bar is a staple for any patio—but it doesn’t mean you’re limited either. If cool features are your main priority when building a pool, consider a swim-up bar with raised seating coming out of the water. A covered patio also presents the perfect opportunity to create a functional outdoor kitchen. Depending on your theme, you may opt for a portable bar cart to house snacks, cocktails, and tubs of ice. Ode to Mother Earth: Take advantage of nature’s most beautiful features by tailoring your décor around the elements. Use sheer white curtains to allow for natural light. Decorate the deck with low maintenance potted plants (e.g. succulents) rather than generic trinkets of which you’ll likely grow tired. Place fresh citrus from your trees into a clear glass vase. Use earth tones in your pool and patio design for a subtle bohemian feel. 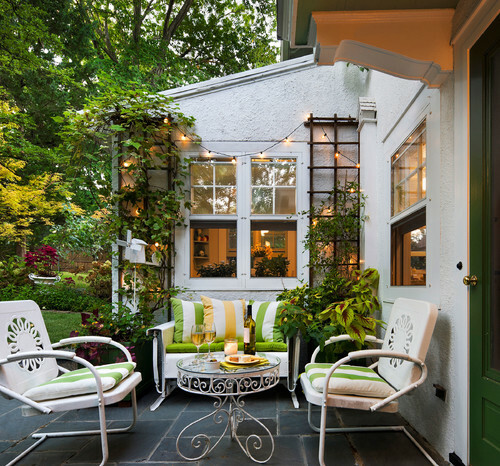 Bring the indoors out: If you’re not lucky enough to have a sunroom or veranda to bring the outdoors “in,” remodel in reverse! Hang a large conversation piece outdoors like a light fixture, shelf, or piece of art. Think beyond traditional patio décor with full-size sofas and end tables. Mount a flat-screen TV to the wall above a wine rack. As long as you can protect your patio from the changing seasons, there’s no reason you can’t get creative. Pool remodeling ideas are as plentiful as colors on a color wheel—it’s all about your personal style and budget. If you can’t decide on a theme, ask your friends and family how they’d describe your style or look to your favorite city for inspiration. 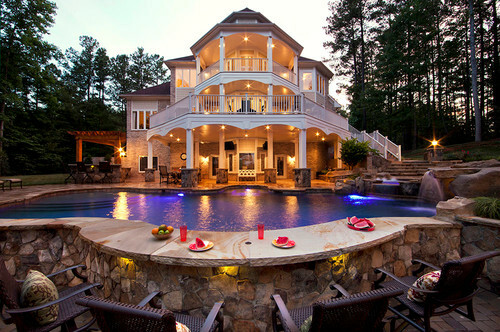 If nothing else, pool builders and design professionals will have your backyard looking magazine worthy in no time.